While corn may not be the answer, biologically derived fuels remain the holy grail for many researchers. 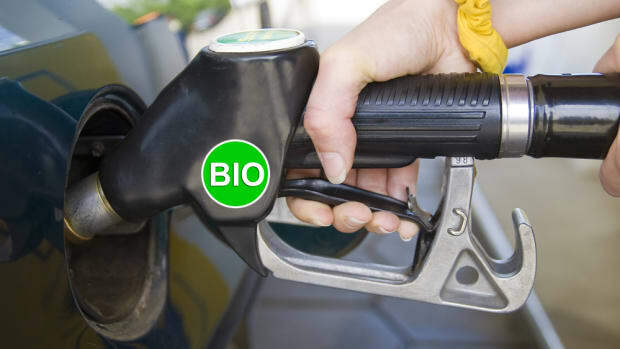 In Part II ("Surely There&apos;s Some Flora Out There to Fuel My Car"), Doug Struck looks at efforts ranging from other cellulosic ethanol options to pond scum. The vision of vast golden fields of corn supplying the fuel for our cars, once the dream of environmentalists and farmers, is disappearing, its allure dimmed by science and reality. Corn-based ethanol was seen as such an ideal solution for our transportation fuel that Congress leaped to write it into law. In a swoon over ethanol in 2007, Congress mandated a fivefold increase in biofuels — 42 percent of it from corn — in 15 years. An industry quickly sprang up: Nearly 200 ethanol refineries have been built, 3 billion bushels of corn are converted yearly into ethanol, and an estimated 70 percent of gas sold in the United States contains at least some ethanol. But as its limitations became clearer, the long-term future of corn ethanol has been clipped. Investors have concluded the industry can only be a niche player, engineers question the practicality of the fuel, scientists doubt its usefulness in reducing global warming, and the federal government is seeking to stop the industry&apos;s growth. "Everybody out here, including the corn ethanol industry, tends to understand the future of corn ethanol is limited," said Craig Cox, the Midwest vice president of the nonprofit Environmental Working Group in Ames, Iowa. Researchers have increasingly questioned corn ethanol&apos;s value in fighting climate change, but the first real splash of cold water on ethanol fever came from the market. Last summer, the price of corn peaked above $6 a bushel, and many ethanol producers were locked into high-priced contracts for their raw material. Then the price of gasoline plummeted to half of its July 2008 high of $4.02 a gallon, and suddenly ethanol refiners found themselves struggling to break even. As the deepening recession cut off business credit, the industry plunged into wholesale bankruptcies. One Web site, earth2tech.com, maintained a "Biofuels Death Watch" map showing the companies that had gone bust or put projects on hold. About 20 percent of operating capacity went idle and new projects stopped. Financiers took a more sober look at the economics of ethanol. "This is a niche industry — a couple percent of both agriculture and the petroleum industries, and you&apos;re always going to be pinched between those industries," Mark Bunger, research director for the private consulting firm Lux Research, said from San Francisco. "I wouldn&apos;t want to put millions of dollars betting on the scenario that oil prices always will go up." And corn ethanol refiners face a Catch-22. If they grow big enough to require lots of corn when the market is tight, the demand will inflate corn prices and reduce their profits. That very dynamic was blamed for soaring corn prices that led to higher global food prices in 2007-2008. Ethanol producers protested that their purchases of corn accounted for a small portion of the price increases, and the global recession eventually dimmed the controversy. But ethanol producers are wary of reigniting that debate. Even as the survivors in the industry slowly begin to emerge from last year&apos;s squeeze — gasoline prices are inching up and their input costs have eased — ethanol faces a limitation from the "blend wall," a federal rule that limits ethanol to 10 percent of gasoline. The alcohol in ethanol burns hot and is tough on gaskets, hoses and the computers of modern cars, a danger that prompted the 10 percent limit. That rule effectively caps ethanol production from all sources at 14 to 15 billion gallons of the 150 billion gallons the U.S. consumes a year, an amount roughly the capacity of the ethanol plants now built and under construction - that means no growth. Ethanol producers are lobbying Congress hard to increase the blend wall, but automotive engineers are raising red flags. New cars can be made to handle ethanol, but retrofitting the nation&apos;s fleet for a higher ethanol blend would be a vast undertaking. Congress watchers say, at best, the ethanol industry will get a slight increase in the blend wall. "It gives you a few more years, that&apos;s all," said Bunger. To add to its problems, the ethanol industry now faces a new administration that — while hardly antagonistic — is at least cool to corn ethanol. Over the anguished cry of industry lobbyists — and the applause of most environmentalists — the Obama administration is trying to turn the nation&apos;s energy policy in a direction that will leave corn ethanol a small and truncated role in the transportation energy supply. The EPA has proposed a rule to enforce a congressional provision in the 2007 Energy Bill, largely ignored under the Bush administration, requiring any new biofuel to be at least 20 percent lower in greenhouse gas emissions than the gasoline it replaces. The rule requires that a new fuel, including ethanol, must account for all of its far-flung carbon impact, including that of forests cut down in distant lands by farmers replacing lost food crops. It is a startlingly bold rule — requiring for the first time that an industry be responsible for its global carbon footprint and indirect affects — and the industry is crying foul. "If they are going to count the angels on the head of a pin for biofuels, they ought to at least take a cursory glance at some of the indirect effects of petroleum use," complained Bob Dinneen, president of the Renewable Fuels Association. The administration has offered corn ethanol refiners a velvet coffin, a grandfather clause that will exempt the existing refiners from the rule, and also will help them get capital to convert to new forms of biofuels. That would put a ceiling on the ethanol industry capacity at about 15 million gallons, enough to satisfy the amount prescribed by Congress in 2007 and meet the 10 percent blend wall. But new corn ethanol production not grandfathered would not pass the greenhouse gas test, according to EPA calculations. EPA administrator Lisa Jackson calls corn ethanol "a bridge to the next generation of biofuels," one the administration clearly sees as a bridge to the past. The EPA is following a path pioneered by California that reflects accumulating research that finds corn-based ethanol is unlikely to reduce greenhouse gases. Burning fuel made from corn initially seemed attractive, since it simply put into the air the same carbon dioxide the growing plants had absorbed. But researchers began to look at the other energy required to grow corn: large amounts of nitrogen added to the soil, regular irrigation in some parts of the country, and mechanical tending to prepare the land, plant the crop, harvest and process it. They also concluded that using corn for fuel instead of food results in land being cleared somewhere else in the world to grow the missing food. And clearing forest or unused land releases huge amounts of carbon into the atmosphere. David Tilman, professor of ecology at the University of Minnesota, did some basic arithmetic in 2006 to point out that using the entire crop of U.S. corn for ethanol would only replace 12 percent of our gasoline. A year later, he and others concluded clearing land for corn or biofuels creates a "biofuel carbon debt" many times worse than using fossil fuels. Timothy Searchinger, of the Woodrow Wilson School at Princeton, used a worldwide agriculture model in 2008 to estimate emissions and calculated that plowing new land for corn ethanol nearly doubles greenhouse gas emissions and increases them for 167 years. He said that over a 30-year span, biofuels end up contributing twice as much carbon dioxide to the air as gasoline would, considering all the global effects. Economist Jason Hill and others at the University of Minnesota recently put a price on environmental and health costs over the life cycle of fuels: Gasoline is 47 cents per gallon; corn ethanol is between 47 to 95 cents per gallon. And they did not consider indirect land use, which would have put ethanol at a "substantial carbon debt," the researchers said. One of the latest studies, from Duke University&apos;s Nicholas School of the Environment, found it would take nearly 50 years for ethanol to recoup the carbon released into the atmosphere from planting corn on unused conservation land. The ethanol industry complains the research counting indirect costs assumes too direct a link from U.S. corn growers to land cleared by farmers in, say, Africa. "Tying it directly back to biofuels is a very tenuous connection," protests Dinneen. In a bow to that argument, the administration is setting up a scientific panel to review the question, and has said it may consider a 100-year measurement period for the indirect effects, prompting head-shaking among environmentalists. "If we are talking about corn-based ethanol versus petroleum gasoline in 100 years, the planet is cooked," grumbled Nick Berning, spokesman for Friends of the Earth in Washington. Despite the administration&apos;s soft-gloved approach, the ethanol industry called in its political chits. Corn-state legislators wrote a five-year moratorium on the "indirect land use" requirement into the House energy bill, one of many concessions that has turned some environmental supporters against the proposed legislation as it heads to the Senate. But cold-eyed Wall Street already has pronounced its verdict. While the administration&apos;s grandfather clause will prop up the value of the existing ethanol plants, financiers are not putting money into any further growth of the industry. "I think what this does is really sets a defined end to the corn era," said Sander Cohan, transportation fuels analyst at Energy Security Analysis Inc., near Boston. "There&apos;s going to be a very active market in controlling and owning the plants that are grandfathered in. Those plants are going to have an enormous premium. But you can&apos;t build any more of these old corn ethanol plants."